You’re invited to the SMART Sip in the Gorge, an event raising funds to help bring the lifelong love of books and reading to local kids! 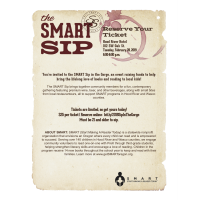 The SMART Sip brings together community members for a fun, contemporary gathering featuring premium wine, beer, and other beverages, along with small bites from local restauranteurs, all to support SMART programs in Hood River and Wasco counties. $25 per ticket | Reserve online: bit.ly/2019SipInTheGorge Must be 21 and older to sip. ABOUT SMART: SMART (Start Making A Reader Today) is a statewide nonprofit organization that envisions an Oregon where every child can read and is empowered to succeed. Serving over 140 children in Hood River and Wasco counties, we engage community volunteers to read one-on-one with PreK through third-grade students, helping strengthen literacy skills and encourage a love of reading. Children in the program receive 14 new books throughout the school year to keep and read with their families. Learn more at www.getSMARToregon.org.